Hey guys! I have another Romwe Giveaway for you now( how can we not love Romwe?). 1. Sign up on Romwe website (If you already registered on Romwe, you don't need to do that). And remember to leave your email address in your comments. 3. 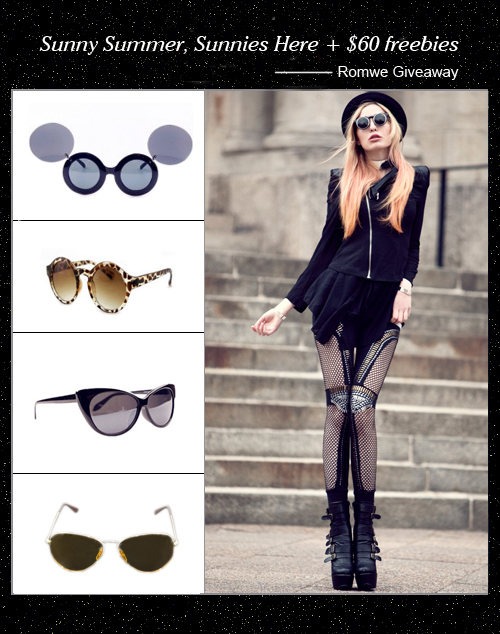 I will choose 1 lucky winner and Romwe will send $60 freebies and a pair of sunnies on the poster randomly to you! This event and the coupon code both end on 20/05/2012. This event is closed and the winner has been notified. Thanks all for participating! Great give away! You have an amazing sense of style.. Love all your looks!! I don't have a pinterest account..Hope I can still participate! Done all! Thanks for the giveaway! Been waiting for another Romwe giveaway for a while now! Thankyou for the great giveaway :-) Even though my chances of winning are a definite 0 for these wonderful giveaways, I'll give it a try again. I follow Romwe on Pinterest (Laura Dittrich) and Twitter (@Democraduras). heeeeeeey :D yay, thank you for this giveaway! Thank you for the lovely giveaway honey!